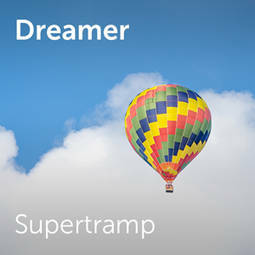 Supertramp (known as Daddy in 1969–70) are an English rock band formed in London in 1969. Though their music was initially categorised as progressive rock, they later incorporated a combination of traditional rock, pop and art rock into their music. The band's work is marked by the songwriting of founders Rick Davies and Roger Hodgson and the prominent use of Wurlitzer electric piano and saxophone. In 1974, they released 'dreamer' . ChorusOnline offers choir arrangements of 'Dreamer'.